Photo right: Rev. 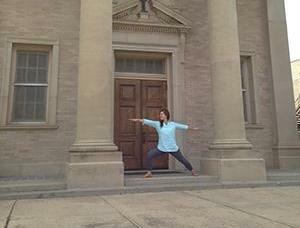 Elizabeth Henry practicing yoga poses at Galloway UMC. Have you ever thought of yoga as a Christian spiritual practice? At Galloway United Methodist Church in Jackson, Mississippi, students gather twice a week to enjoy classes together with scripture, a short devotion, and inspirational hymns and music incorporated into the ancient practice of yoga. Through this ministry, we're growing together in spiritual and physical health. Rev. Elizabeth Henry, Galloway's Pastor to Children and Families, the primary instructor, and she received her training through Yahweh Yoga, the only Christian yoga studio certified by the Yoga Alliance. For more information, check out the recent article featured in the faith section of The Clarion Ledger. With help from a Missions Grant of the Mississippi Connectional Ministries team, neighbors throughout the Mississippi Annual Conference are invited to share in this practice as well. Reserve your spot by April 1 for a Yoga and Prayer Retreat. Join yogis from across the Mississippi Methodist Conference at Seashore Assembly in Biloxi, on Friday evening, May 20 through noon on Sunday, May 22 for worship, yoga, prayer, workshops, and even a bonfire on the beach! There are 35 spots available. The deadline to register is April 1, 2016. The cost is $150.00 which includes lodging, meals, all materials, and instruction by Yahweh Yoga certified instructors. A $50 deposit is due at registration to reserve your spot by April 1. Full payment is due by May 1. Limited scholarships are available. For more information and to register, email Rev. Elizabeth Henry (EHenry@gallowayumc.org) or call the Galloway United Methodist Church office at 601-353-9691.